PPRuNe Forums - TU154 out of Sochi is missing. Russian military TU154 is missing after departing Sochi. Said to be army plane with 70-100 souls on board, including musicians. Some info that they were on a flight to Latakia, Syria. (CNN)A Russian military plane carrying 83 passengers and eight crew members disappeared from radar Sunday morning after taking off near Sochi, a Defense Ministry spokesman told the RIA Novosti news agency. A Russian military plane has disappeared from radar just minutes after take-off from the Black Sea resort of Sochi, local media have said. They quoted a source at the emergency ministry as saying the missing aircraft was a Tu-154. The country's defence ministry later confirmed its plane was missing, adding that 91 people were on board, Russia's news agencies said. Unconfirmed reports said the plane was flying to Syria's Latakia province. Interfax news agency reports quoted the emergency ministry source as saying the plane disappeared from radar 20 minutes after taking off from Sochi's Adler airport at 05:20 local time (02:20 GMT). The aircraft went missing as it was manoeuvring over Russia's territorial waters, the source added. Local news agencies later quoted Russia's defence ministry as saying that 83 passengers and eight crew were on board the plane. Reports suggest a military music band and reporters were among those on board the aircraft. A search operation was now under way, Russia's state-run Rossiya24 TV channel said. 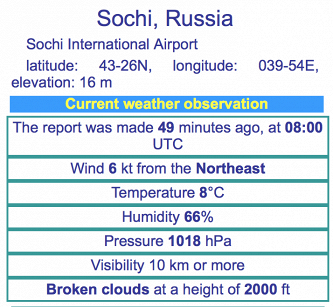 The plane made a refueling stop in Sochi. Flight originated from a military airport near Moscow. Russian Defence Ministry reporting debris found in the Black Sea. Location appears not far from Armavia A320 crash in 2006. This will likely mark the longest ever gap between TU-154 fatalities since its introduction in 1972 at almost six years (previously no more than three up to 2011). And for six years the Russians have refused to return the wreckage of the Polish Airforce Tu-154. Musicians aboard were from the Alexandrov Ensemble - aka the Red Army Choir. Due to entertain troops in Syria. Eh. Tu-154 is notorious for it tendency to a stall and immediate transition to flat-spin afterwards. And here we have fully loaded plane at low attitude and above treacherous coastline waters. It was almost certainly microburst or something. To put an act of terror into consideration would be clearly exotic, is not Europe there you know. Russia’s RIA news agency, citing an unidentified security source, said preliminary data indicated the plane had crashed because of a technical malfunction, Reuters reported. and I wouldn't be surprised. The '154 apparently has a reputation of being a reliable aircraft, but the ones still flying are old & weary, and ru.mil kit tends to suffer from lack of maintenance across the board. Video of the same Tu-154 5 years ago. Not the same plane CHG1, the one doing the dance on the sky was 88563, the one which was lost now is 88672. Surprising that it was a B2, I thought those had been grounded and only M variants still flying. But this B2 even had the new livery. The world is a poorer place this morning. Anyone who's ever played Tetris will be familiar with the work of the Alexandrov Ensemble. Recorded ATC of this flight from engine start approval till the end. 12:29 Moscow time: The Tu-154 plane that crashed off the Black Sea coast near Sochi on Sunday was manufactured more than 30 years ago and underwent scheduled maintenance this September, and was flown by an experienced pilot, Russia’s Defense Ministry said. "The Tu-154 plane of the military and transport aviation of Russia’s Defense Ministry was flown by experienced pilot Roman Volkov," the ministry said in a statement. Volkov is class 1 pilot who had more than 3,000 hours of flight. The Tu-154 plane was manufactured in 1983 and had 6,689 hours of flight. "The last repair was on December 29, 2014, and in September 2016 it underwent scheduled maintenance," the ministry said. Ensemble Concert at the House of Music in 2009. Song and Dance Ensemble of the Russian Army - A.V. Alexandrov. Chief conductor and artistic director - People's Artist of Russia, Professor Igor Raevskii. Hope someone can do a transcript in English... don't understand enough to make head or toe of it. But it does sound like routine traffic until they start calling him quite urgently. But it does sound like routine traffic until they start calling him quite urgently.